It's about reflecting about myself, finding my true colours, the raw emotions, and emerging forward. I hope I expressed that okay in the wallpaper. As you can see, I coloured the piece in Photoshop and also transformed parts of it. I chose a very simple and clean font to represent "a fresh start". Although this looks incredibly simple, the title is all this needs to create the right kind of impact and atmosphere. The line work and artwork is amazing; a download is mandatory to see how beautiful this is. well I just saw the drawing, very lovely indeed, emerging to start over, I like that. Simply beautiful Chingers... Both versions are well-drawn, but I think I like the colored one better ;). You did a good job of showing the emotion-- I actually got chills when I viewed the wallpaper in full. Definitely worthy of a fav from me! Keep up the great work! 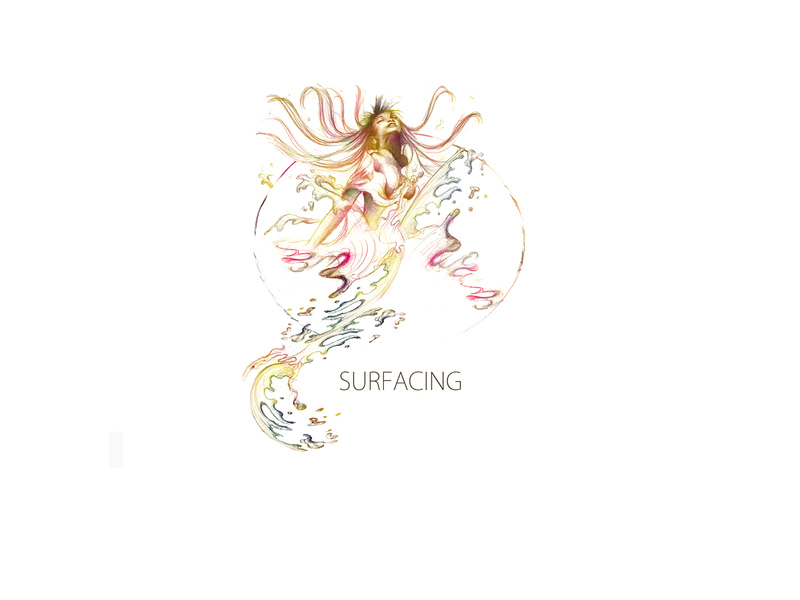 But really I would call it floating rather surfacing. And yeah, I can really feel the emotion...surfacing to get a fresh start on life. This is simply great. A fabulous piece of work. I love every little piece of it. The coloring, the idea, the drawing, everything! Btw, did you noticed there's a small rectangle shape in the left? What's up with it? Very well done indeed. You've done a great job expressing what you felt - and the title is certainly apt for this piece. I like it a lot... and I think "incredibly simple" isn't the right term for this. It may look as if it was just a view lines... but it's also an original and it's not simple at all to get such a drawing! I love how you drew the splashes of water. And the face turned out really well too! Just because the background is white, doesn't make it simple... cool design, looks like some kind of cd cover indeed. People also say the background was empty... oh well... if it was all filled with other stuff... the whole effect would be gone! The thing is... your drawing would work even better if the format was another one... square. In my point of view the wallpaper size isn't that well suited but I can understand that you wanted to make it a wallpaper, but it's not the right format for this kind of drawing. I liked it then, I still like it now.